As I have now mentioned for what feels like the gazillion time (sorry...), I attended Eurostar this year as a presenter. "Why every system test department should have a test developer (...or two)"
I had already had the chance to present the session earlier this year, just recently at a local conference "DevCon" in my home town Karlskrona, and the first time at the larger conference "Scandinavian Developer Conference". It makes a real difference when you go up and don't have to do the presentation for the first time and don't have to think about things like: How long does it take, is there some places that needs to be improved (or even removed). When I got accepted as a speaker earlier this year I was really glad and also surprised that I'd made the program. 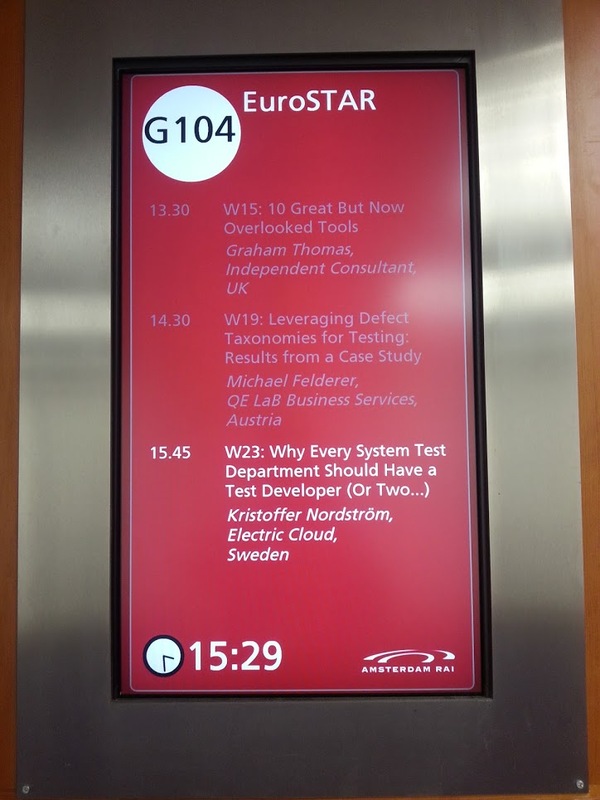 And now coming here to Eurostar, the first larger test conference that I attended, the place where I had seen so many of the great testers that I look up to and respect, it felt a bit strange. The presentation went (IMHO) really well and I felt that I had a good flow and a good energy up on stage. The reactions in twitter-verse, the emails I received, and the people coming up afterwards to talk seem to tell me that people in the audience enjoyed the presentation as well, something I had been a bit nervous about since I was after all "coming home" and presenting for other testers. People who are trained at scrutinizing and keeping a sceptical mind. When it all was over, things had went well, and I packed my things, the room slowly got empty and I had this feel that I really didn't want this moment to end to soon (silly I know...), so I looked out over the big empty room and thought: Wow, it's done! That was a moment that I will remember for a long time. 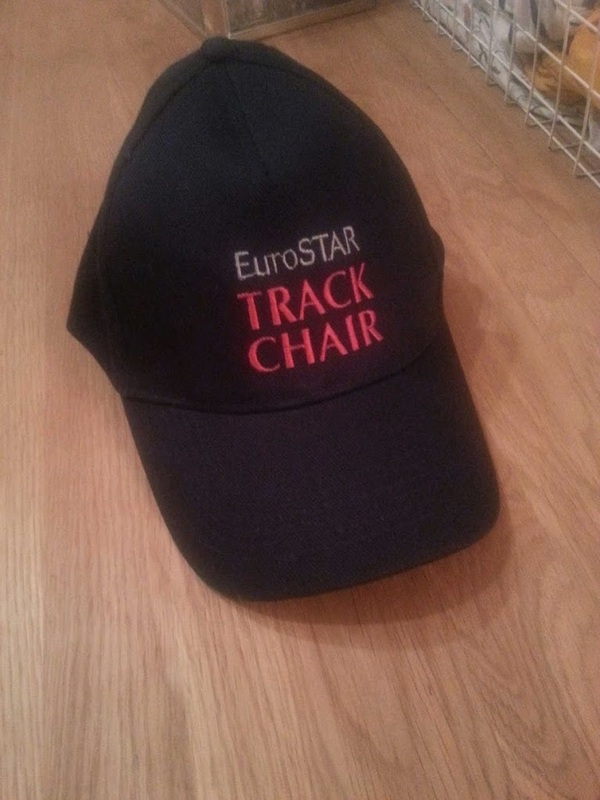 A few weeks before Eurostar I got the question if I would be interested in helping the conference and the organizers being a track chair. Something I responded back to that I would like to help out with. For those of you who don't know what a track chair does, it's basically being the wing-man of the presenter for the session. Introducing him/her, making sure that the technical things that the presenter might need are in place (internet connection, laptop etc. ), the practicalities of it is handled by the technicians at the conference, but if something goes wrong or is missing, then it's the track chairs job to make sure the problems get solved and taken care of. You are also helping the speaker keep track of time and afterwards managing the time allocated for questions to the speaker. It meant that I had to contact the two persons that I would be track chairing for and get to know them a bit so that I could make a decent introduction of them to the audience. Some speakers want long introductions and lots of details, others wants it shorter and just getting the presentation on its way, it's up to you as a track chair to find out. One of the two speakers never responded back to my email, and later it would show that the person never sent in the presentation material and had backed out from presenting. But the other presenter, Marc van t' Veer from Polteq/Netherlands responded back and we decided to meet up during the conference. It was only on Monday when travelling to Eurostar that I got to know that the slot had been cancelled for the first speaker and that the organizers was going to find someone else. For my own slot I had the veteran and battle scared track chair Morten Hougaard from Denmark who took care of me. Morten has track chaired before and I was real lucky to have him as my track chair. He emailed me beforehand and also set up a short telephone meeting so that we could get to know each other a bit beforehand. I picked up a few tricks from Morten on good things to do as a track chair, and it was very relaxing having him on my slot. If you ever get asked if you want to track chair on a conference I highly recommend you to do it. The work load is quite frankly not that high, and you get a chance to see things from the other side as well, and not just as a speaker as conferences. It is also a great way to get to know new people that you might not have gotten to know otherwise. I hope I'll see you at Eurostar 2013 in Gothenburg! After attending Eurostar the last days and waiting at the airport currently, I feel a need to write down stuff and just dump all of the things that is spinning in my brain.